I just had a cup of Bigelow Decaf Green Tea for Breakfast. Having a hard time with my allergies here the last 2 or 3 days. So I’m not quite up to par today with a bad headache. But after I had my Tea I went to the local Kroger here up the road for a few items. Then stopped by McDonald’s and picked up Breakfast for Mom. After Lunch I ran the vacuum and dusted. Then took it easy the rest of the afternoon. For Dinner tonight its a Bacon and Blue Buffalo Burger w/ Shredded Hash Browns. I’m having another one of the Wild Idea Buffalo – BACON BLUE BURGER. I tried this for the first time a while back and loved them! It comes frozen and there’s 3 – 1/3 lb. Burger Patties. The Premium Ground Buffalo is mixed with Wild Idea Buffalo Bacon, Blue Cheese, and seasoning. I’ll be preparing it as I do all Wild Idea Buffalo Burger. I’m dressing it up a bit this time. To prepare I’ll need; Maytag Crumbled Blue Cheese, 1 slice of Boar’s Head Bacon, Smucker’s Sugar Free Blackberry Jam, and a toasted Healthy Life Multi Grain English Muffin. To start it I seasoned it with McCormick Grinder Sea Salt and Black Peppercorn, lightly seasoned. I then pan fried it, on medium heat, in Extra Light Virgin Olive Oil about 3 1/2 minutes per side. Buffalo gets done rather quickly due to it’s so lean. And as all the Wild Idea Buffalo Burgers it cooked up perfect! As the Burger was cooking I toasted a Healthy Life Multi Grain English Muffin. By using the Muffin instead of Burger Bun I saved on Calories, Fat, and carbs. I also microwaved a slice of Boar’s Head Bacon. To assemble the Burger I took the bottom slice of the Muffin and added some of the Smucker’s Sugar Free Blackberry Jam. Next I added the Burger, Bacon Slice, Crumbled Blue Cheese, and the top half slice of the Muffin. And I had one incredible Burger! The Burger its self has bits of Wild Idea Buffalo Bacon in it along with Blue Cheese. Then the added Maytag Blue Cheese, Bacon slice, and Blackberry Jam just put this Burger over the top! That was my last Wild Idea Bacon Blue Burger that I had in the freezer. I’ll be ordering more but right now Wild Idea is out of stock on them. The Maytag Crumbled Blue Cheese I used is hard to find. I used to buy it at the Kroger Cheese Shop but they no longer carry it. So now I have order it DIRECT from Maytag Dairy Farms (https://www.maytagdairyfarms.com/) I also ordered some of their Cheddar Cheese Spread. Both are so good, the best Blue Cheese that I have ever found! Then for a side I prepared some Simply Potatoes Shredded Hash Browns. Seasoned them with Salt and Pepper and served them sprinkled with Sargento Reduced Fat Shredded Sharp Cheddar. For Dessert/Snack later a bowl of Skinny Pop – Pop Corn and Diet Peach Snapple to drink. Seventy seven-years after the first wheels of Maytag Blue Cheese were made, our family tradition continues. Each wheel is handcrafted on the family farm in the rolling hills of central Iowa. We are still owned and operated by the grandchildren and great-grandchildren of E.H. Maytag. His legacy is the pleasure and joy taken from good food shared with people you cherish and we are proud to be a part of it. On October 11, 1941, the first wheels of Maytag Blue Cheese were formed and put to age in our caves. Today, the tradition continues. For Breakfast this Monday morning I prepared a Potato and Ham Skillet. I prepared a bag of the Simply Potatoes Steakhouse Seasoned Diced Potatoes. Midway through the cooking time I added a 1/2 bag of Kroger Brand Diced Ham. Also had a cup of Bigelow Decaf Green Tea. It started out another morning of below zero at minus 4 degrees. We had high of 25 degrees and cloudy all day. I took advantage of this heat wave and I took Mom up to Kroger so she could get what she needed and then afterward I went to Meijer for a few things. Felt good to get out, I think I had a touch of Cabin Fever! Not much else going on today. For Dinner tonight its a Bacon and Cheese Turkey Burger w/ Baked Fries. I had the Honeysuckle White Lightly Seasoned Turkey Pattie in the freezer so I grabbed one and let it thaw overnight in the fridge. They are 1/4 lb. patties (4 to a package) and 170 calories per burger. For the Bacon I’m using the Kroger Simple Truth Turkey Bacon. It fries or bakes up real easy and has excellent taste. I fried the Bacon and set it aside until I needed it. Then to prepare the Turkey Burger, I’m using a medium size skillet that I sprayed with Pam Non Stick Cooking Spray and added a tablespoon of Extra Light Olive Oil. Heated the skillet on medium. When the skillet was ready I added the Turkey Burger. I fried it about 6 minutes per side. After flipping the Burger I topped it with a slice of Kraft Deluxe Sharp Cheddar with about 1 minute of cooking time left. I served the Burger on a Healthy Life Whole Grain Hamburger Bun. Topped the Turkey Burger with some Heinz 57 Sauce and the Turkey Bacon. The Burger fried up great and the toppings all worked well together. For a side I baked some Alexia Organic Yukon Select Fries. Seasoned them with McCormick Grinder Sea Salt and Black Peppercorn Medley. Baked them at 425 degrees for 16 minutes. They bake up beautifully and seasoned just right, excellent Shoestring Fry! Plus they are only 120 calories and 15 net carbs. For dessert later a bowl of Skinny Pop – Pop Corn with a Diet Peach Snapple to drink. Our seasoned turkey patties are great for a last minute barbecue or quick dinner. They’re lightly seasoned for great taste, ready for the grill or stove. To start my morning off I toasted a Healthy Life Whole Grain English Muffin that I topped with some Smucker’s Sugar Free Blackberry Jam. I also fried up a couple of Jennie – O Turkey Breakfast Sausage Links and made my morning cup of Bigelow Decaf Green Tea. The hot and humid weather is still with us, maybe a tad less humid. Gave Mom a hand with laundry. Changed the bed sheets and did some bedroom cleaning. Dad was released from the hospital last night and was moved to a local rehab center. He was at this one the last time and we really liked over there. Not sure how long he’ll be there this time, hopefully not long! After lunch I went to the local Kroger and picked up a up a few items we needed.Back home not a lot going on so I got the cart out and trimmed some bushes at the side and back of the house. Then took a spin around the neighborhood and down by the lake. For Dinner tonight it’s Izzy’s, Boneless Cod Sandwich. We I had my Dinner planned out but I received an email from Izzy’s Deli that a coupon for 2$ off for their Boneless Cod Sandwich, my Dinner plans just changed! So tonight’s Dinner I had planned will be tomorrow night’s Dinner and tonight I’m having the Izzy’s Boneless Cod Sandwich. I had this once before but it’s been years. I do remember how good it was so I took advantage of the coupon. The Sandwich was huge and as good as I remembered it being! Nice size Battered Cod Fillet, seasoned just right. It comes on Rye Bread with Tarter Sauce. One delicious Sandwich. I could only eat 1/2 of it, I’ll havethe other half for Lunch tomorrow. It came with a Potato Pancake which I gave to Mom. Mom had the Izzy’s Reuben. For Dessert/Snack later a bowl of Skinny Pop – Pop Corn along with a Diet Peach Snapple to drink. For Breakfast here in West Chester on my Birthday, I prepared some Simply Potatoes Shredded Hash Browns, heated up 2 Jimmy Dean Turkey Sausages, and my favorite morning beverage a cup of Bigelow Decaf Green Tea. Turning 58 today and still Cancer Free! So while some days may be a bit rough from time to time, It’s still a very good day! Lot of rain overnight and it finally ended early this morning. We started out at 41 degrees and it dropped throughout the day. These past few days of above normal temperatures has spoiled everyone. Mom took my Dad to a Doctor’s appointment this morning and then stopped and had Breakfast. While they were out I cleaned the house. After that just kicked back and got caught up on some shows I recorded. For Dinner tonight I prepared a Turkey Bacon and Muenster Cheese Buffalo Burger w/ Baked Fries. It’s my weekly Buffalo Burger craving night! Tonight I’m having a Wild Idea Buffalo 1/3-Lb Buffalo Burger patty. And tonight’s Burger is going to be a Turkey Bacon and Muenster Cheese Buffalo Burger. Along with the Buffalo Burger I’m using Jennie – O Turkey Bacon, Murray’s Muenster Cheese, and Healthy Life Whole Grain Hamburger Bun. I started by frying the Jennie – O Turkey Bacon. I need 2 slices so I fried 4 slices, Bacon math you know! It’s a household rule when preparing Bacon always double the amount because you know when you fry Bacon you’re going to eat half of it before its ever ready to use. Thus, Bacon Math comes into play! Next I preheated up a small skillet that I sprayed with Pam Cooking Spray, seasoned my Burger with McCormick Grinder Sea Salt and Black Peppercorn. I then pan fried it, in Extra Light Olive Oil, about 3 1/2 minutes per side, after flipping the Burger I added my slice of Cheese, I’m using Murray’s Aged Muenster Cheese. i served the Burger on a Healthy Life Whole Grain Bun, topped the Burger with the Turkey Bacon I had made earlier and done! Love a good Burger and love these Wild Idea Buffalo Burgers, and topped with the Jennie – O Turkey Bacon and Muenster Cheese just adds to the goodness! To go with my Burger I baked some Alexia Organic Yukon Select Fries leftover so I prepared them to go with my Burger.Seasoned them with McCormick Grinder Sea Salt and Black Peppercorn Medley. Baked them at 425 degrees for 16 minutes. They bake up beautifully and seasoned just right, excellent Shoestring Fry! Plus they are only 120 calories and 15 net carbs. I had a Diet Peach Snapple to drink. For Dessert later a 100 Calorie Breyer’s Chocolate Ice Cream Cup. For Breakfast this morning I Poached an Egg and served it on a Healthy Life Whole Grain English Muffin. And as usual I had a morning cup of Bigelow Decaf Green Tea. Another cold morning out there, about 8 degrees and near 0 with the wind chill! it did get to about 30 degrees and sunny out. After Lunch I took a drive over to my Oncologist Doctor’s Office and dropped off some candy for the staff for Christmas. Then dropped some more off at my Family Physician Office. ‘Tis the Season! For Dinner tonight I prepared a Sweet Slice Boneless Smoked Ham and Swiss Grilled Sandwich w/ Baked Fries. While at our local Kroger the other day, they had Boar’s Head Sweet Slice Boneless Smoked Ham on sale in the Deli. I had not tried this one before so I purchased some to give it a try. As all the Boar’s Head products it was delicious and only 60 calories and 1 carb per serving. I had made a Sandwich of it for Lunch yesterday and I’m having it for my Dinner tonight! To make the sandwich I’ll need the Boar’s Head Sweet Slice Boneless Smoked Ham, Sargento Reduced Fat Sliced swiss Cheese, French’s Yellow Mustard, and a Healthy Life Whole Grain Bun. To prepare it I took a medium size skillet, sprayed it with Pam Cooking Spray, and heated it on medium heat. When heated I added my Ham and cooked it for about 4 minutes, flipping the slices several times. After flipping it for the last time I piled it up in the skillet and topped it with a slice of the Sargento Swiss Cheese. As the Cheese was melting I loaded it on to the Healthy Life Bun. Topped with French’s Mustard and served! The Boar’s Head Sweet Slice Boneless Smoked Ham makes one delicious Sandwich! When I order any sliced Cold-Cuts I always have them slice it paper-thin. Having Diabetes 2 I have to watch calories and carbs. And with the Cold-Cuts sliced thin I can pile it up and still be using the same amount as meat sliced regular. Sort of tricks the mind into thinking you’re getting more than you really are! To go with my Sandwich I baked some Alexia Organic Yukon Select Fries leftover so I prepared them to go with my Burger.Seasoned them with McCormick Grinder Sea Salt and Black Peppercorn Medley. Baked them at 425 degrees for 16 minutes. They bake up beautifully and seasoned just right, excellent Shoestring Fry! Plus they are only 120 calories and 15 net carbs. I had a Diet Dr. Pepper to drink. For dessert later a Weight watchers Cookies and Cream Ice Cream Bar. To start my morning off I toasted a Healthy Life Whole Grain English Muffin that I topped with some Smucker’s Sugar Free Blackberry Jam. I also had my morning cup of Bigelow Decaf Green Tea. It was in the low 30’s this morning when I went out to fetch the morning papers. It was cloudy and mid 40’s out for the day then. Gave Mom a hand with laundry. Changed the bed sheets and did some bedroom cleaning, not really dirty just let things pile up a bit. After lunch I went to the local Kroger and picked up a loaf of Healthy Life Whole Grain Bread, some Butter for Mom, and some 2% Milk. Back home not a lot going on. We need some bright sunny days around here, these cloudy and gray days are getting old! For Dinner tonight I prepared a Sweet Italian Turkey Sausage w/ Baked Shoestring Fries. I used the healthy and delicious Jennie O Lean Sweet Italian Turkey Sausages. I had a package of two in the freezer so I let them thaw overnight in the fridge. I pan fried them, using Pam w/ Olive Oil Cooking Spray and no oil needed. Heated the pan on medium and cooked a total of about 17 minutes, turning the Sausages occasionally. They fry up plump and brown, as always Jennie – O Products always have that fresh taste to them. The Sausages have 160 calories and 0 carbs per Sausage. I served it on a Aunt Millie’s Reduced Calorie Whole Grain Bun and topped with French’s Spicy Brown Mustard. Love these, thank you Jennie – O! I made 2 of them having one tonight and the other for Lunch tomorrow. Then for a side I baked some Alexia Organic Yukon Select Fries. The more I have these the more I’m liking them! Seasoned them with McCormick Grinder Sea Salt and Black Peppercorn Medley. Baked them at 425 degrees for 18 minutes. They bake up beautifully and seasoned just right, excellent Shoestring Fry! Plus they are only 120 calories and 15 net carbs. For dessert later a Jello Sugar Free Dark Chocolate Pudding topped with Cool Whip Free. Rolled out to grab the morning papers and it wasn’t quite as cold as it has been, in the low 20’s. For breakfast I prepared a packet of my favorite gravy, Pioneer White Peppered Gravy. Along with 2 slices of toasted Healthy Life Whole Grain Bread and my morning cup of Bigelow Decaf Green Tea. Had a high in the 40’s today with plenty of sunshine. Finally starting to melt our snow on the ground that’s been sticking around. Straightened up the pantry and cleaned the fridge today. Ran a couple of errands for Mom and stopped by the bank before heading back home. For dinner tonight I prepared Chunky Baked Potato with Cheddar and Bacon Bits Soup w/ Grilled Ham and Swiss. I used Boar’s Head Maple Glazed Honey Coat Ham, Hellmann’s Light Mayonnaise, Kraft Sharp Cheddar Cheese, and Aunt Millie’s Whole Grain Bread. I had purchased the Boar’s Head Maple Glazed Honey Coat Ham at Kroger. I love all the Boar’s Head Meats and Cheese. Always fresh and lower in calories and sodium. To make the sandwich I buttered one side of both slices of bread with I Can’t Believe It’s Not Butter and then on the unbuttered sides layered the Ham, a bit of Hellmann’s Light Mayonnaise, and then the Cheese. I then grilled the sandwich in a preheated pan that I had sprayed with Pam Cooking Spray. Grilling both sides until golden brown. I love a Grilled Cheese Sandwich, but the added Ham makes it even better! A Classic Comfort Food Sandwich. I also used my favorite Potato Soup, Campbell’s Chunky Baked Potato with Cheddar and Bacon Bits. Love this Soup, it’s nice and thick with some big chunks of Potato with just the right amount of Cheddar and Bacon Bits. Plus it can’t be much easier to prepare, just open the can and heat it up in a small sauce pan. Love the taste and it’s only 190 calories and 19 net carbs. A good meal for a Cold Winter’s Day! For dessert later a Healthy Choice Dark Fudge Swirl Frozen Greek Yogurt. Campbell’s Cheddar & Bacon Bits Chunky soup satisfies hunger with big chunks of real baked potatoes and crisp bacon bits in a creamy soup base with cheddar cheese. Campbell’s Chunky soup is the soup that eats like a meal. Eat it for lunch and this thick and hearty Campbell’s baked potato soup will fill you up and stick with you through the day. When hunger calls, answer with chunky Campbell’s canned soup. You can heat it on the stove or in a microwave. Either way, satisfaction is just minutes away. Water, Chicken Stock, Potatoes, Baked Potatoes, Cream, Vegetable Oil, Modified Food Starch, Cheddar Cheese, Pasteurized Process Cheddar Cheese. Do not add water. Stove: Pour soup into medium saucepan. Heat slowly until hot, stirring occasionally. Microwave: Pour soup into medium microwave-safe bowl or 2 individual microwave-safe bowls. Cover; microwave on high for 3 1/2 minutes or until hot, stirring once during heating. Careful, keep covered 1 minute. Stir before serving. Promptly refrigerate any unused portion in separate container. Recommend use by date on can end. Store unopened can at room temperature. I had to be at the hospital early this morning and have my yearly scans done. I have them once a year to make sure the Melanoma Cancer hasn’t snuck in again! It’s always a nervous time for me when I go through this. It brings back a lot bad memories. I’m an amputee, I lost my left leg to Melanoma back in 2001. I go to the Oncologist for my 6 month checkup on October 19th so I’ll find out the results then. It was a cold morning here, 32 degrees! Didn’t do a whole lot today, got rid of some leaves outside and a load of laundry. 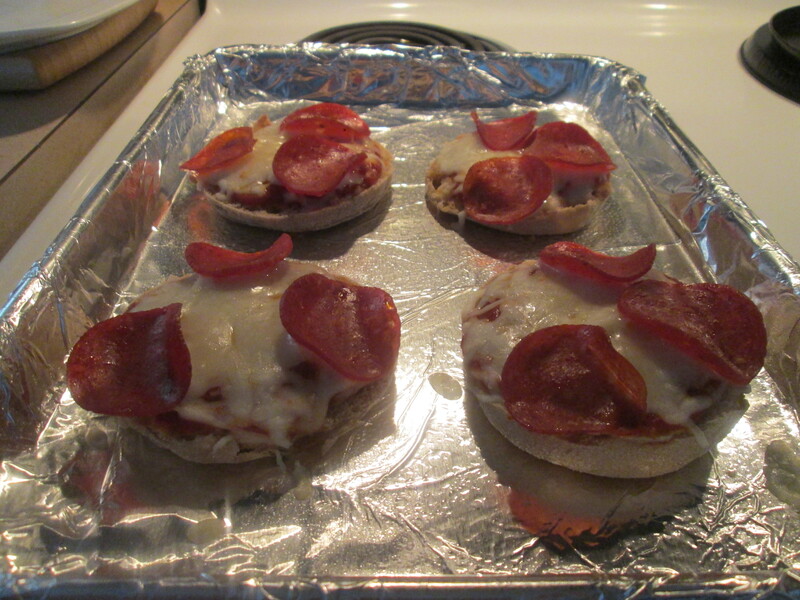 For dinner tonight it’s English Muffin Pizzas. 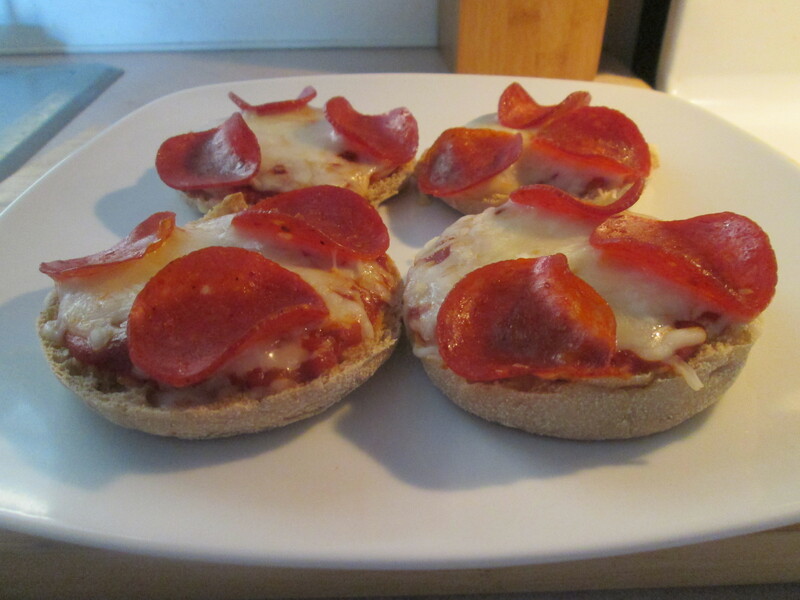 Some English Muffin Pizzas just sounded good for dinner. It’s been quite a while since I’ve made these. I used to have them for lunch every now and then. Easy to make and you’ll just need 4 ingredients to prepare it. 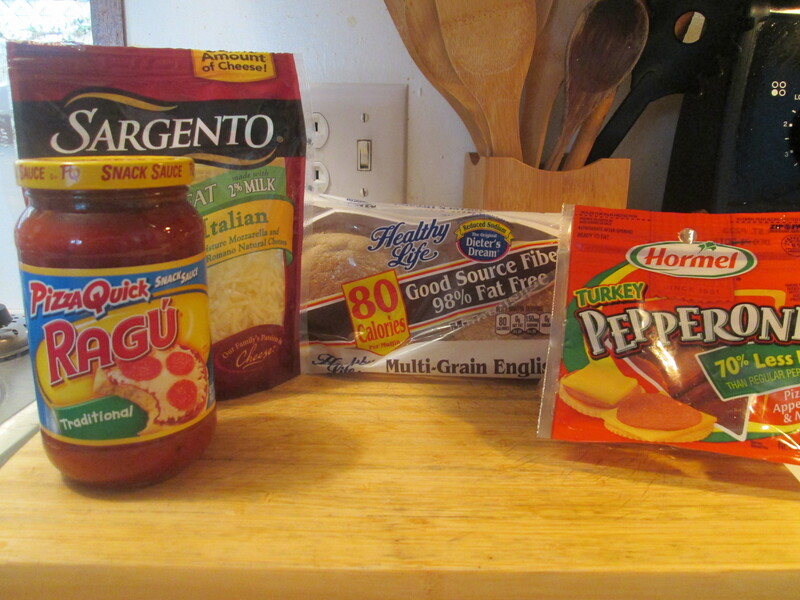 To make them I’ll need; 4 Healthy Life Whole Grain English Muffins (split), 1/2 cup Ragu Homestyle Pizza Sauce, 2 cups Sargento Reduced Fat Shredded 4 Cheese Italian, and 16 slices Hormel Turkey Pepperoni. To start I preheated the oven to 375 degrees F. Placed the English Muffin halves cut side up onto a baking sheet. Spoon some of the Pizza Sauce onto each one. Top with the Mozzarella Cheese and Turkey Pepperoni Slices. Just bake for about 10 minutes in the preheated oven. I love these little English Muffin Pizzas. I had Pepperoni on mine but you can add any combination of ingredients you like. Easy to make and they make a good meal! For dessert later a Jello Sugar Free Dark Chocolate Mousse. 2 – Place the English muffin halves cut side up onto a baking sheet. Spoon some of the pizza sauce onto each one. Top with mozzarella cheese and pepperoni slices. 3 – Bake for 10 minutes in the preheated oven, or until the cheese is melted and browned on the edges. Another gloomy Winter’s Day, low 30’s and bit of wind. We got a couple of warmer days starting tomorrow, highs in the 40’s, before getting colder again. Possibly a White Christmas they’re saying. For Breakfast a one Egg Scrambled Egg, 2 Jennie – O Turkey Sausage links, Wheat Toast, and a hot cup of Bigelow Decaf Green Tea. Another good start of the day! It was house cleaning today and some afternoon College Basketball. For dinner tonight, a new Wild Idea Buffalo Product. 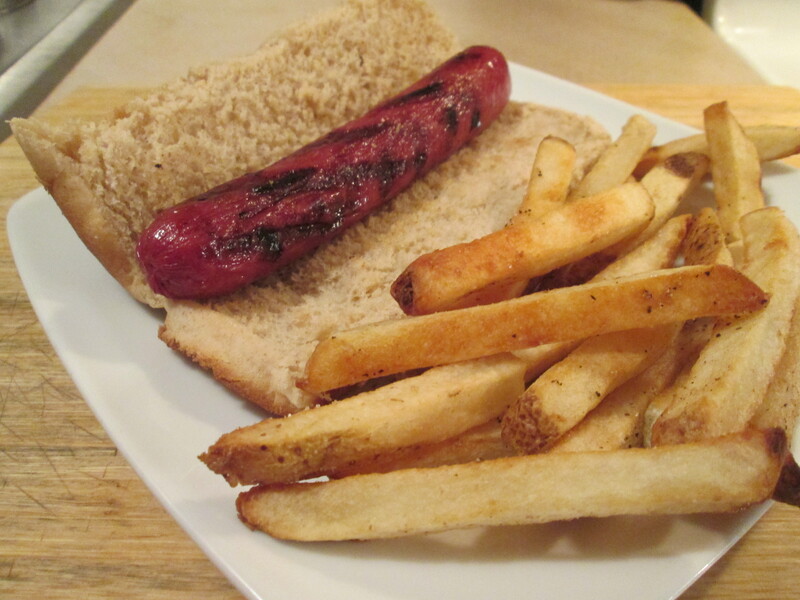 I prepared Buffalo Hot Dogs w/ Baked Fries. I had ordered the Wild Idea Buffalo – Cheyenne River Gift Bundle, that was delivered to me yesterday afternoon. It contains; 2 – 8 oz. Top Sirloin Steaks, 2 – 16 oz. Bone-In Ribeye Steaks, 2 – 1 lb. Ground Buffalo, 1 – 1 lb. Buffalo Hot Dogs, and an autographed Copy of Buffalo for the Broken Heart by Dan O’Brien. Trying the Hot Dogs tonight, one of the flat out mouth watering 16 oz. Bone-In Ribeye Steaks tomorrow, and using the 2 – 1 lb. Ground Buffalo packages for some 3 Bean Buffalo Chili sometime next week. Life is good! The outdoor gas grill was stored in the shed for the Winter so I prepared the Buffalo Hot Dogs inside. 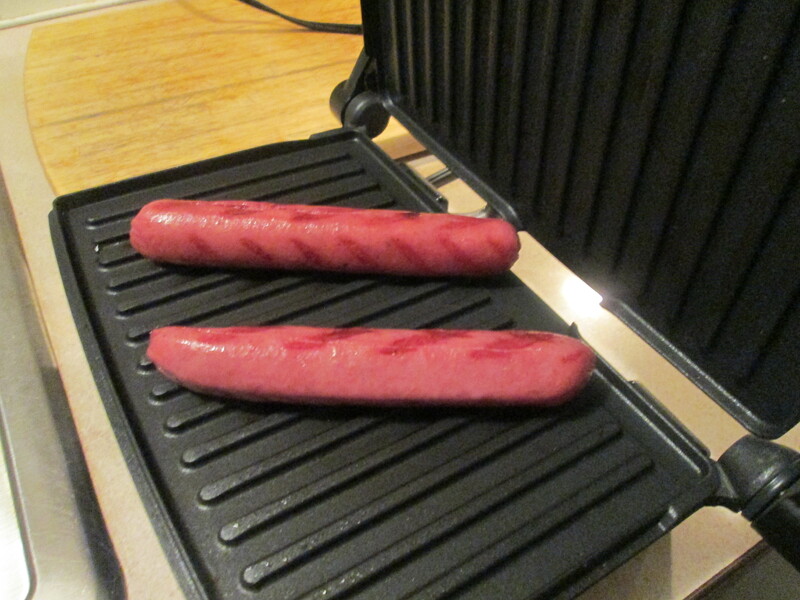 I used my Panera Bread Grill Press to grill the Hot Dogs on. First time I grilled Hot Dogs with it and it and t hey turned out great! Nice grill marks and got the Dogs done just right. First time I’ve tried The Wild Idea Buffalo Hot Dogs. The Dogs are well seasoned, nice smoky flavor, and very meaty! Served it on a Healthy Life Whole Grain Hot Dog Bun and topped with French’s Yellow Mustard, fantastic tasting Hot Dog! Served it with a side of Ore Ida Simply Cracked Black Pepper and Sea Salt Country Style Fries, served these with a side of Hunt’s Ketchup for dipping. For a dessert/snack later some Ritz Whole Grain Crackers topped with Cracker Barrel 2% Extra Sharp Cheese along with a Wild Idea Buffalo Snack Stick. Another new Item from Wild Idea Buffalo, 100% grass-fed Buffalo Snack Stick! We hit our new Hot Dog Recipe right out of the park! 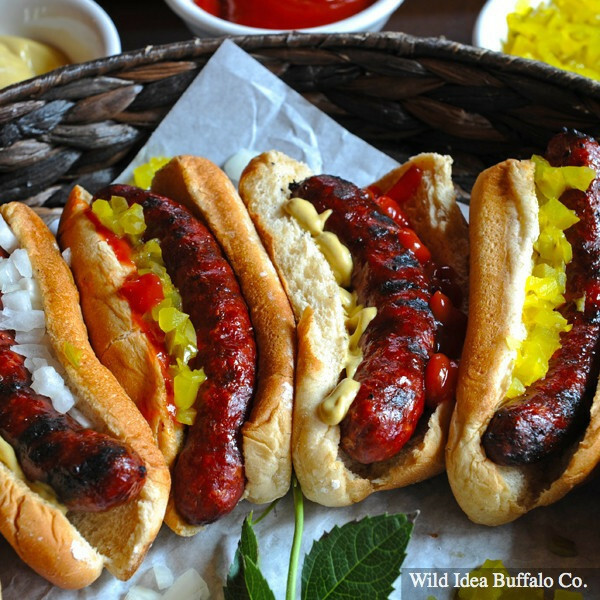 Wild Idea Buffalo’s NEW casing-free Hot Dogs are incredible – one bite and you’ll be hooked! Wild Idea’s 100% Nitrite Free Premium Buffalo Franks are made from our 100% grass-fed buffalo — no filler, no junk, just mouth watering flavor in every bite. Kids love them and adults do, too. You won’t find these Premium Buffalo Hot Dogs in your supermarket cooler. They’re only available on our website or directly from our Sales Team in Rapid City, South Dakota. These Premium Buffalo Franks are meaty, seasoned, smoked, 100% delicious, and will change the way you think about Hot Dogs. It’s time to come back to Hot Dogs. 8 Hot Dogs per 1 lb. package. Ingredients: Grass-fed Buffalo, Organic Spices: [Black Pepper, Coriander, Garlic Powder, Ground Mustard, Onion Powder, Organic Milk powder (organic skim milk), Paprika, Pure Cane Sugar, Sea Salt] and Cultured Celery Powder. Our latest Wild Idea: Buffalo Snack Sticks! Our loyal customers have been asking for a buffalo meat stick that is healthy, packed with protein, and delicious. So, we’ve been hard at work to produce the best tasting and most healthy meat stick on the market. 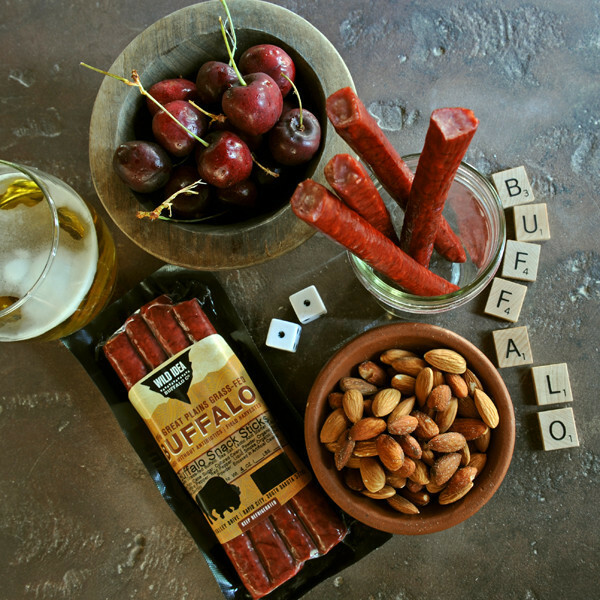 We are now proud to introduce this all new 100% grass-fed Buffalo Snack Stick! These Wild Idea Buffalo Snack Sticks are perfect for an after school snack or anytime that you need or want a healthy and tasty snack. These Buffalo Snack Sticks also make great stocking stuffers! Each package contains four buffalo Snack Sticks. Total package weight 4 oz. Product should be kept refrigerated.